Since it is August and all sorts of yummy fruits and veggies will be available, so will the fruit flies. 1. Find a mason jar and put in about 1 tablespoon of apple cider vinegar and a piece of fruit. 2. 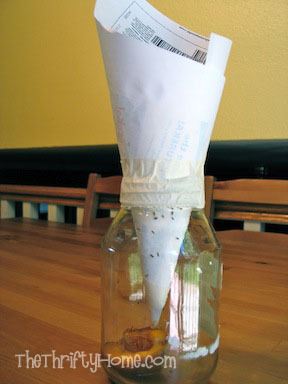 Make a funnel out of paper and leave a fruit fly sized hole in the bottom of the funnel. 3. Put the funnel in the jar and seal with tape. The fruit flies will go into the funnel, but not out. Any fruit will work in the jar as long as you have removed the fruit from your kitchen counter (If there is fruit on the counter, they will go to that first). 4. After you catch the fruit flies, put the jar in your freezer for a few minutes to kill them and then you can take it out and use it again. My jar was full of fruit flies after 2 hours on the counter. We've had lots of trouble with fruit flies where we live due to all the tomato fields around us. My sure way of ridding my house of them is 1/3 cup apple cider vinegar and a few drops of dish soap - no funnel needed. Just set the cup on the counter and you'll soon have a large collection in the bottom...maybe that's why the people here call them "drunkards!" I can't wait to try this fruit fly trap. I've tried some others that didn't work (probably because I wasn't patient enough). This one seems like the trick. TFS. Awesome! I am trying this--we have fruit flies in every room! OH MY! I was just complaining about the fruit flies last night. Thanks for the great idea!! I'll definitely be giving this a try, they're always a big nuisance! nice tip! Saran wrap works great too with a rubber band or tape to seal it to the jar and small holes poked in it, they get in but not out. mix some dishwashing liquid and apple cider vinegar and coat the walls of the jar, then you won't have to waste fruit or put the jar in the freezer because the dishwashing soap makes them drown and slip when they try to stick to the sides. I found this on Pinterest. I just used banana peels and they worked great. Thank you! I definitely have to try this! For the past two months we have been plagued with fruit flies! I leave no food out, or anything, and we cannot figure out where they are coming from!! ARRGHH! I have tried the apple cider vinegar and soap, it did no good. Have washed everything down with amonia, another day with bleach, nada. Going out of my mind here! I couldn't figure the source of ours either, until I started picking the dry leaves off the dirt in my basil plant! It was breeding them!! I went to Pinterest for the purpose of finding a cure for fruit flies.